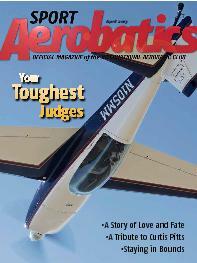 I wrote the lead story, “Your Toughest Judges,” for the April 2013 issue of Sport Aerobatics, the monthly magazine of the International Aerobatic Club (IAC). You can download the free PDF version of the magazine here. The feature includes several in-flight photos of my Extra 300L and my happy customers. The FAA has released the list of contract towers that will close in April. At many of those airports, the control towers operated part-time, and most pilots regularly use airports that do not have control towers, so the shift back to flying at an “uncontrolled” airport is not as great as some media reports make it seem. Here’s video of a recent training session in basic aerobatic maneuvers including lazy-8s, chandelles, loops, Cuban-8s, rolls, and spins. The student on this flight is already a flight instructor, but he has had limited experience with aerobatics. We are flying my Extra 300L. A related video is here. The IAC has launched a new website at www.IAC.org. It’s a good resource if you’re interested in aerobatics, aerobatic competitions, and airshows. The site includes a list of instructors and flight schools that offer aerobatic training.